Naloxone (also known as Narcan®) is a medication called an “opioid antagonist” used to counter the effects of opioid overdose. Naloxone is used in opioid overdoses to counteract life-threatening depression of the central nervous system and respiratory system, allowing an overdose victim to breathe normally. Naloxone is a nonscheduled (i.e., non-addictive), prescription medication. Naloxone only works if a person has opioids in their system; the medication has no effect if opioids are absent. Although traditionally administered by fire personnel, naloxone can be administered by trained police officer, which makes it ideal for treating overdose in people who have been prescribed opioid pain medication and in people who use heroin and other opioids. Naloxone has no potential for abuse. 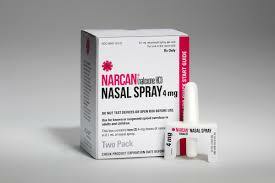 Naloxone that is sprayed up the nose is a temporary drug that wears off in 20-90 minutes. Fentanyl is a dangerous, powerful, Schedule II narcotic that is 50 to 100 times more potent than heroin and is responsible for an epidemic of overdose deaths. Fentanyl is not only dangerous for the drug’s users, but for law enforcement and first responders who unknowingly come into contact with it in its different forms. Fentanyl can be absorbed through the skin or accidental inhalation of airborne powder. NARCAN® (naloxone HCl) Nasal Spray is the first and only FDA-approved nasal form of naloxone for the emergency treatment of a known or suspected opioid overdose. Vital Medical Services provides Nasal NARCAN medical director oversight coupled with a standing order to public safety agencies. Program administration includes education, training, oversight, implementation and reporting protocols pursuant to local, state and federal guidelines. Pharmaceutical fentanyl is a synthetic opioid pain reliever, approved for treating severe pain, typically advanced cancer pain. It is prescribed in the form of transdermal patches or lozenges and can be diverted for misuse and abuse in the United States. Overdose deaths involving synthetic opioids other than methadone, which includes fentanyl, increased almost 47% from 2016 to 2017. Roughly 28,400 people died from overdoses involving synthetic opioids other than methadone in 2017. Reports from law enforcement indicate that much of the synthetic opioid overdose increase may be due to illegally or illicitly made fentanyl. According to data from the National Forensic Laboratory Information System, confiscations, or seizures, of fentanyl increased by nearly drastically from 2012 to 2017. This suggests that the sharp rise in fentanyl-related deaths may be due to increased availability of illegally made, non-pharmaceutical fentanyl, and not prescribed fentanyl. The number of states reporting 20 or more fentanyl confiscations every six months is increasing. Naloxone is a safe and effective antidote to opioid-related overdoses, including heroin and fentanyl, and is a critical tool in preventing fatal opioid overdoses. Depending on state and local laws, this medication can be administered by EMS, law enforcement,8 other drug users,9 or family and friend bystanders who have obtained the medication.